Unquestionably the biggest of the dedicated photo sites, Flickr deserves its fame. Its pages don't necessarily show off your images at their best, but larger versions are never more than a click away. With groups and commenting tools, you can do more with your snaps than just admire them. The open API has led to a whole cottage industry of tools that plug into your Flickr photo collection to do anything from order prints without re-uploading to slipping a sideshow into your screensaver. 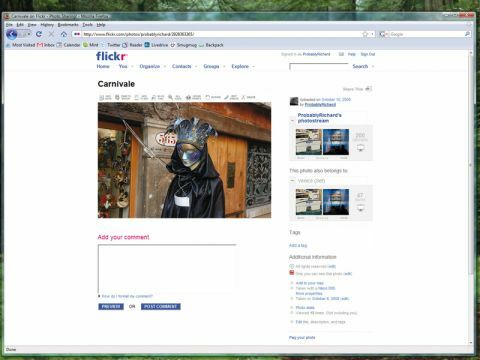 One of the most advanced – the Picnik image editor – is available within Flickr itself, making the site a one-stop shop for uploading, editing and displaying your images. With a free account, you're limited to two image sets, 1GB a month of uploads and 100 visible pictures. A Pro account is almost mandatory, giving you access to your original high-res files, account statistics and unlimited uploads and collections. Both accounts give you access to all the community features, which is where the service really shines over the competition.